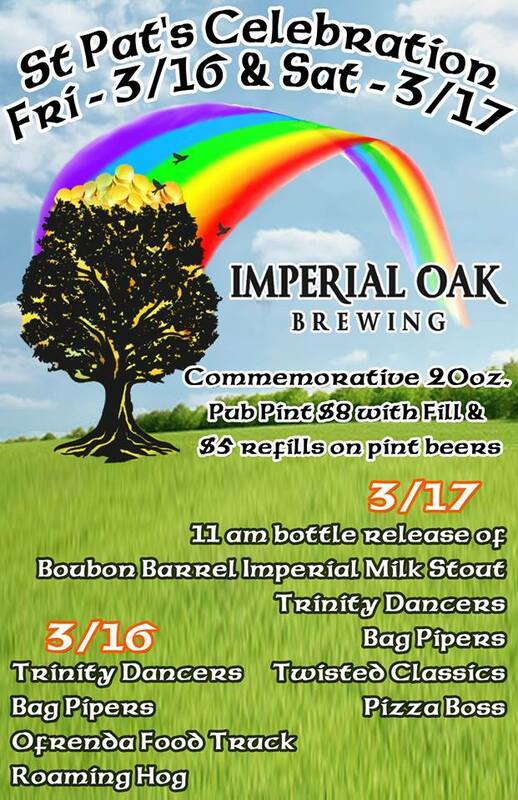 Come celebrate St. Patrick’s Day with Imperial Oak. We’ll be setting up a tent next to the building for a 2 day celebration on both Friday 3/16 and Saturday 3/17. Once again we’ll be offering our 20 oz commemorative pint glass. $8 gets you the glass with a fill then you can refill it both days with any of our 16 oz beers. A limited number of glasses will be available both Friday and Saturday. We’ll also have our Milk Stout “Udderly Black” and IPA “Crank It Hop” available for the first time in 4 packs of 16 oz cans and our Imperial Milk Stout “Udder Madness” available in 22 oz bottles all weekend long. We’ll also be releasing Bourbon Barrel Aged “Udder Madness” on draft on Friday and in 22 oz bottles on Saturday. Bottle sales will start when we open at 11am, limit will be announced the day of. Here are the details. 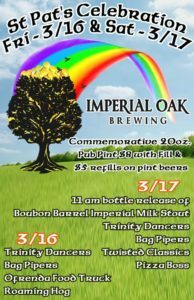 bottle release, St. Patrick. Bookmark. Pizza Boss Beer Dinner 3/22!